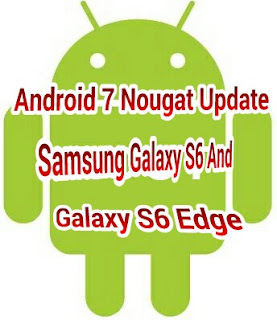 Tech news for today, has it that Samsung Galaxy S6 and Galaxy S6 edge users can now start receiving the latest Android 7 Nougat update OS. This update was announced previously before now, to be rolled out by February, which happens to be last month, but due to some reasons, it couldn't come out then. But it's here now for all users of Samsung. Some European countries like Switzerland, Germany and Italy are now receiving this latest update that has its firmware version as G925FXXU5EQBG. The update is currently limited to users in European countries. And is expected to reach other market in other countries very soon. normal Nougat features, with a lot of improvements made on its features. Some of the improvement include, newer and cleaner user interface, has Samsung Cloud feature which is automatically syncs native apps, such as Contacts, Calendar and Notes, so all your important data. If you are using the above mentioned device and yet to receive the update. Just relax as the update is expected to be rolled out to some region. So when yours is teady, your device gets the update.